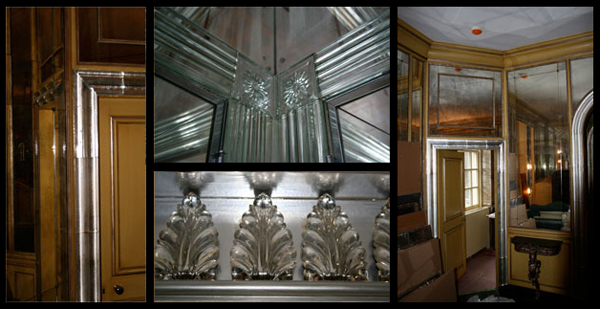 This was an extremely challenging restoration project at a architecturally significant mansion located in Lake Forest. Sharon took molds from original cast glass acanthus leaves and door moldings to initiate metal hot casting molds to be created and produced perfect replicas of the originals. The door molding was silver leafed on the reverse side to match the originals. The acanthus leaves that lined one room above the crowm molding were mirrored on the back. She also coordinated other important aspects of the glass restoration, such as subcontractig a telented wheel engraver to faithfully recreate glass medallions and long strips of mirrored glass that framed larger mirrors. She found another skilled artisan to recreate tiny fluer de lis bevels that embellished many of these same mirrors.